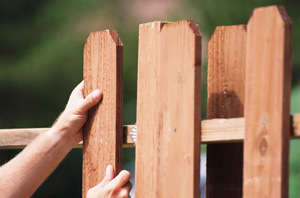 Fences are mainly used for security or other practical purposes, but they are also a great way of enhancing the beauty of a yard or garden and in the same time reflect your personality. Regardless of your style or preferences, there are tons of models and colors from where you can choose. These fences remind of the cottage style and are used for defining the boundaries on a property and also for creating backdrops for country gardens. Their style and design make them suitable for basically any type of garden/home, but they don’t offer too much security because of their low height. 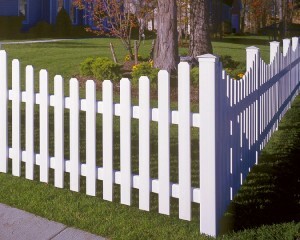 There can be found straight pickets, scalloped pickets, decorative finials and square posts which can decorate your yard, garden or even interior successfully. 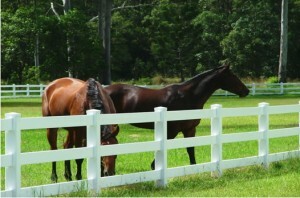 Split rail fencing is the fence for the typical farmhouses and is made of interlocking horizontal rails. They span the rolling hills of farmhouses and are used for defining boundaries. If you’re looking for a more functional approach, you can add thin chicken wire along one side of the fence to close its open areas. Today, more modern versions of iron fences have been reproduced in steel, aluminum and other materials, thus allowing you to obtain an old, beautiful look with much lower costs and maintenance. 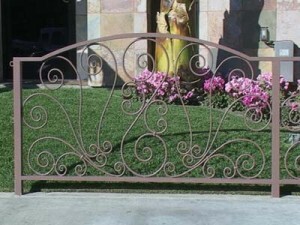 If you’re the adept of more formal fences, you can opt for the cast-iron ones. 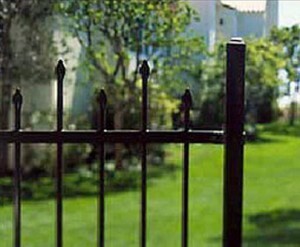 Keep in mind that iron fences can be created at different heights, depending on the amount of security you need. Stockade or privacy fences provide the highest security for your property, offering at the same time a beautiful decorative fence. Their heights are generally maintained at 6 feet, a height which doesn’t allow curious views by passers-by and offers protection for your children and pets. 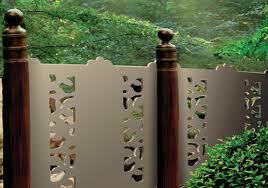 Stockade fences reproduce the artwork that is found in the interior of your home by yard ornaments and garden art. They are also a suitable background for travelling vines with stems which cover certain areas in blankets of different flowers. Tree branches are a cheap and rustic way to make your house or garden differentiate from the others; not to say that they add an organic, creative touch. Firstly, think about the period of time you want the fence to stay, its height and the amount of light you want to get through. A wattle fence from sampling branches it’s ideal if you want more privacy. Next find hardwood branches, because these don’t rot as much as other wood does. 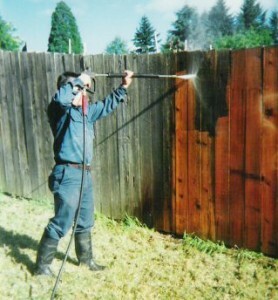 Put your branches along the desired line of the fence and make sure you have enough branches. Moreover, it’s recommended to have a few extra branches, just in case you accidentally break or damage some of them. You must now dig the post holes for the big branches that will sustain the fence. Put the branches which will be used as posts into the dig holes, cover them with dirt and pack the dirt around the branches by tamping the ground. 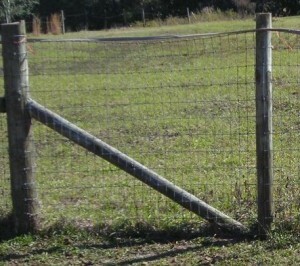 Now determine the distance between the post holes; for example taller, heavier fences should have their posts closer. Tie cross-braces to the posts. You can either use wire or rope( in the case of rope tie a square lash for branches perpendicular to each other). 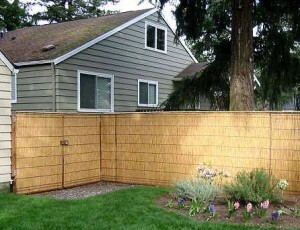 Before you start securing the little branches, think once more about how you want your fence to look like. Lashing it’s an appropriate choice if you like the backwoods pioneer look, but it also requires the longest time.If you want more privacy, a wattled fence is a smart choice. 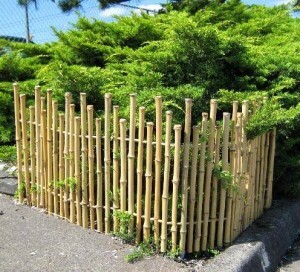 This type of fence is made of fresh, flexible saplings, which are woven in and out of posts close together. Thus, the final product will look like a wicker-type weave. Finally, start to glue smaller branches to the fence cross-brases. It’s not recommended to nail them, as the nails might destroy the branches. 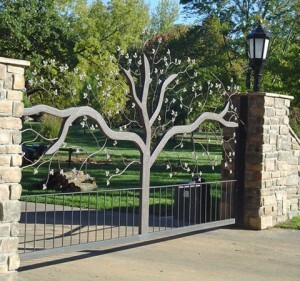 In addition to trees and shrubs, there is a variety of materials and designs available for decorative fences that will obtain basically the same results. If you want security and privacy without sacrificing the contact with the outside world, screening fences might be the thing for you. Living screenLiving screen represents a suitable alternative if you already have a wooven wire, chain link or solid plank fence and you want to avoid the expenses of tearing them down; instead you can transform them into a vertical garden. For wire or lattice work, vines are just the choice. All you have to do is to plant them and train them up the fence. 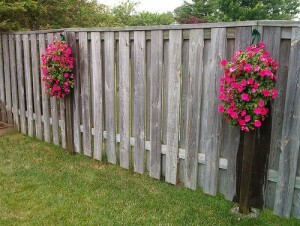 From small closed eye bolts and wires make a support structure on the fence and then grow the vines on it. If you’re wondering if fruits or vegetables are suitable for your living screen, the answer is that they sure are. Decorative concreteDecorative concrete is not such a popular choice, mainly because it makes you think about massive walls and imposing buildings, but a wide variety of special concrete for screening is available on the market. 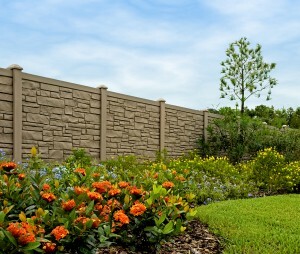 A mortared block wall offers a long-lasting beauty and together with a solid foundation, allows for unrestricted air flow through the landscape. Decorative concrete can also be used in sunny areas where the light shade is sought for. 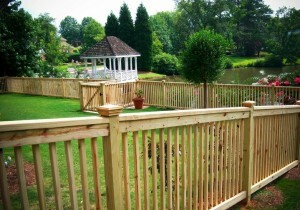 Wood framed bambooIf you want to have a versatile fence, start working. Firstly, start with building open frames of 2×2 inch of wood or with a diameter of 2 inches for bamboo, fastened to larger posts set in concrete. Attach the bamboo shades sized to fit perfectly within the wood/bamboo frame by using eye bolts screwed to the underside of the top cross members. All you have to do when you want a little privacy is to lower the bamboo screens and for sunshine and breezes only roll them up. 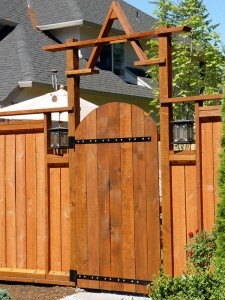 Open and shutA solid fence might be expensive and confining, but this represents a low-cost alternative by alternating the planks with open spaces, at the same time giving your yard an airy feel. 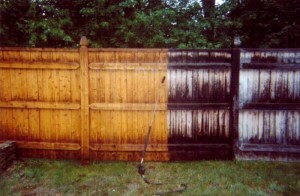 Specialists advise you to build a plank fence and skip a board every 3 or 4 you install. 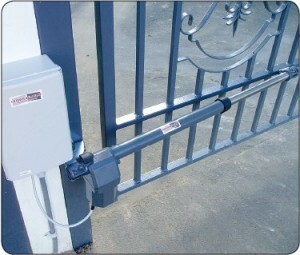 Attach stainless steel wires vertically every 2 inches from top and bottom nailers in the open spaces. Next step is to train vines to grow up the wire for decorative screening between planks and alternatively leave out wires and hang plants from pots inside the openings. 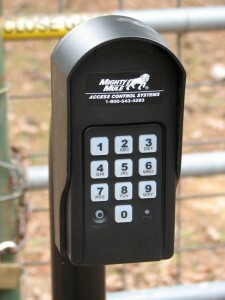 People started to build fences for obtaining security for their animals and families, but today more and more manufacturers are using an old aspect to give the fences a worn-out look and a classic elegance. Now they can be used for practical purposes, such as protection and security, as well as for decorative purposes. Stone fences use rocks in a dry mortar stacking process and are popular in areas with stone quarries. A cement-mix mortar is used for keeping the stones in place. Nowadays, the modern stone fences add a misterious touch to the traditional-style house architecture. Dry-stacked stone fences are thought to be a lost art in many communities, unfortunately. 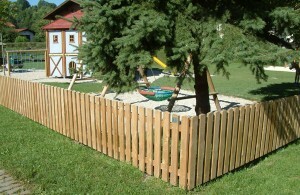 This type of fence uses natural wood cut into smaller sticks, which is nailed to the fence posts. The traditional styles include baluster-style fences, which consist of square sticks attached horizontally and spaced 1/2-2 inches apart. There are also oval shaped sticks. 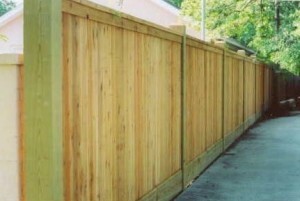 6-foot pieces are used for a modern stick fence height and the shorter boards use 4-5 foot pieces . These fences are specific for the Victorian style, but not only; surprisingly, even cemeteries used decorative metal fences. Picket, hairpin and scalloped styles were incorporated into metal designs. The combination designs consist of bow and picket, bow and hairpin and hairpin and picket. The end post styles include single lines, panels, open with scroll details and single scroll design. 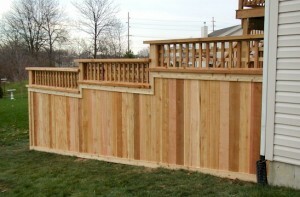 These fences consist of 2 horizontal wooden pieces and a series of shorter vertical wood pieces, which are nailed at about 1, 2 inches apart. They can reach heights up until 4 feet high. 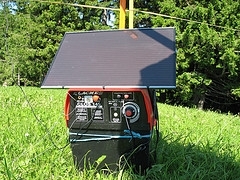 To be more stable, the pickets are attached to a wooden horizontal strip. At the top, there are displayed shapes, which include French-Gothic styles, Gothic point and simple rounded point. Modern pickets have in their composition concrete composites or polymers. 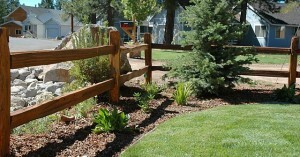 Split rail fences used to be common in rural areas and replaced metal fences. The fence consist of 2, 3 vertical rails and the stacked split-rail fence connects the rails in zig-zag, where the rails stack together at the post section.